I was back in Charlottesville last Thursday and Friday. Not because of my clinical trial or for medical screenings, or anything like that. 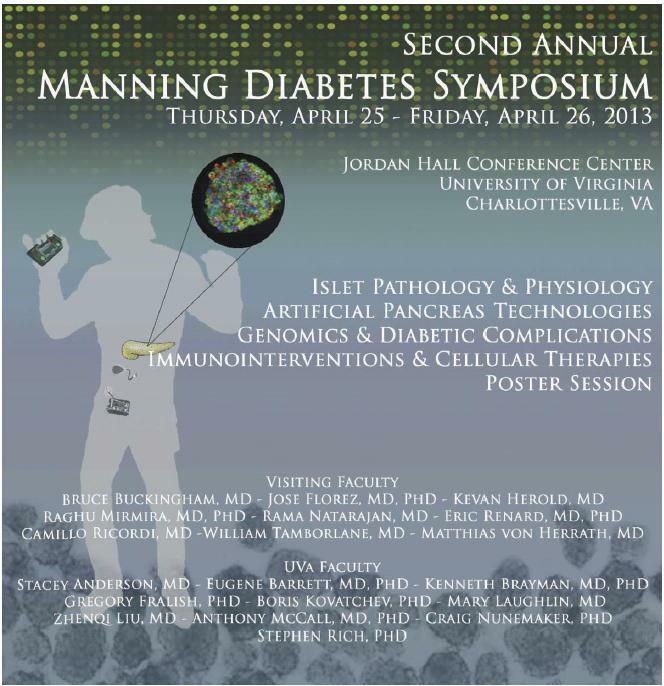 This time I went to attend the Manning Diabetes Symposium. This is a meeting of very, very smart people who spent parts of two days talking about the great diabetes research taking place in various parts of the world. Seriously, I was the only one there that didn’t have a ton of letters after their name. In the sessions, the speakers would cover their topic then take questions from the audience, many of whom were presenters at the conference too. Day one was devoted partly to islet beta cell stress and islet pathology and potential targets for therapy. Basically, they’ve nailed down the development of diabetes to beta cell stress, leading to insulitis (inflammation of the islets), which leads to pre-diabetes, then destruction of the beta cells resulting in diabetes. Can anything be done to stop this process, or possibly reverse it? They’re working on it. Interesting insights from Dr. Raghu Mirmira, Eli Lilly Professor of Pediatric Diabetes and Director of the Pediatric Diabetes Research Group at Indiana University, Indianapolis. Also on Thursday was a lot of artificial pancreas talk. First off, from Dr. Bruce Buckingham, Professor of Pediatrics Endocrinology at Stanford University, information on camp and in-home studies designed to try and measure reductions in nocturnal hypoglycemia related to the AP. In short, they were successful and they plan to do more studies in the near future. In addition to that, Ed Damiano, PhD from Boston University came and spoke about all of the great AP research and trials they’re doing up in Boston. This was mostly the same talk I heard back in February at the Children With Diabetes Focus on Technology conference in the D.C. area (you can read about it here). I really liked the fact that during the question-and-answer session afterward, he made a real point of saying that artificial pancreas technology is a great thing, but it’s far from the perfect solution. I liked the question-and-answer portion with him anyway. He’s very passionate about the work they’re doing up there, and he really is an intelligent person who seemed to be very forthcoming and a step ahead of the questioners the whole time. Finally on Thursday, there was Dr. Eric Renard, who is doing AP work at Montpellier University in France. He brought us up to date on current developments in Artificial Pancreas technology and testing, including what’s happening in Europe, where their testing is a little further along than it is here in the USA. After the talks, there was something called a Poster Session, which I’ll talk a little more about tomorrow because it was very cool. I’ll also cover what was presented on Friday before the end of the conference. This was a very educational couple of days and I can’t wait to tell you about the second half. Just in case you’re wondering, I did not receive anything for attending this symposium, or for writing about it. I paid my fee to attend, I drove to Charlottesville, and I made (and paid for) my own accommodations. « Post-mortem on Monday morning’s low. Can I just say how incredibly jealous I am of you right now??? The symposium sounds amazing!!! !